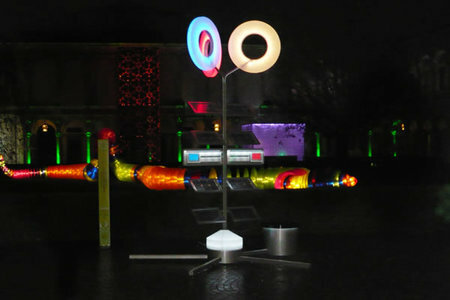 Sanyo will display the ‘SUNPLANT’ installation at the ‘Lighting Objet 2008’ in ‘Tokyo Building Tokia Galleria Square’. 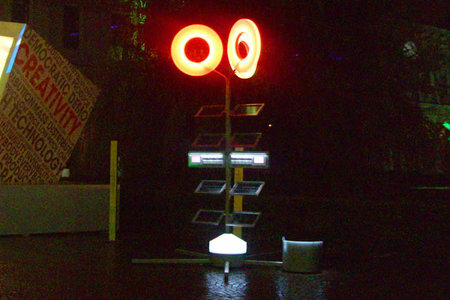 The ‘SUNPLANT’ is an installation designed by Toshiyuki Kita, one of the world’s most recognized designers, and incorporates both Sanyo’s rechargeable ‘eneloop’ batteries and highly efficient ‘HIT’ solar cells, displaying the concept of charging ‘eneloop’ rechargeable batteries and LED lights through clean energy. The ‘SUNPLANT’ was born from the concepts of Sanyo’s brand vision ‘Think GAIA’ and the eneloop universe product line-up based on it which emphasizes clean natural energy from the sun powering the electronic devices found around people everyday with batteries that can be reused and recycled. Agreeing with this concept, Toshiyuki Kita proposed the ‘SUNPLANT’ installation design as a way to capture the future of energy and power in a very familiar-type object, a plant. Toshiyuki Kita extended his creative field from Japan to Italy and to the international arena as an environmental and industrial designer since 1969. He has created many hit products for European and Japanese manufacturers, ranging from furniture, LCD TV sets, robots to household goods and appliances. Many of his works are possessed by the Museum of Modern Art, New York, Centre Georges Pompidou, Paris, Pinakothek der Moderne, Munich, and other museums around the world.